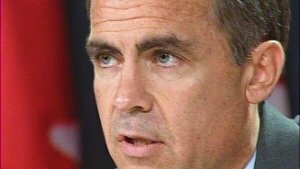 Bank of Canada Governor Mark Carney warned on Thursday that interest rates could rise sooner if the growth in household debt, which is related to the housing market, was not tempered. "A concern of the Bank of Canada...has been the pace of growth of household debt, which has been related to dynamics in the housing market. And so a number of measures have been taken to slow that pace," he told a Reuters-sponsored event, noting that the growth rate has fallen "quite nicely" to 3 percent from 13 percent. "We have conducted monetary policy in, we think, a pretty transparent way that has highlighted the risks to this, and the potential consequences for the path of interest rates. In other words, they could be higher sooner if this isn't addressed or this isn't adjusted in a more timely way." Asked if there was a Canadian housing bubble, and whether this could burst, he said: "We see valuations in the housing market as being quite firm and very firm in some markets. We are seeing an adjustment in those prices and we are now seeing household debt levels stabilize, albeit at high levels. But things are moving in the right direction, including on the new build side, on the housing starts side."